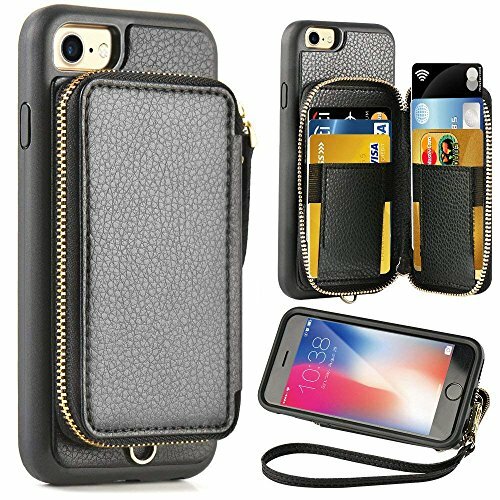 ZVE iPhone 7 Wallet Case with Anti-lost Lanyard. ONLY fit for Apple iPhone 7 4.7 inches (Not fit for the larger iphone 7 plus 5.5 inches). Give enough space for more than 10+ Cards as well as 15 cashes and your keys which include IDs, credit cards, debit cards and cash. Every pieces of YKK Zipper can bear 1000 times pull strength testing, which can keep your belongings well. Open the YKK Zipper of the wallet and stand it up with a credit card and then make easier to adjust angle of viewphone when you use the phone. With anti-lost lanyard, hold your phone more convenient and without worry of losing. Made from Vegan Leather and TPU base shell, soft leather texture, making it comfortable to the touch and a pleasure to look at. Protection extends to inside of the case and outer bumper, both of which provide shock-absorption. The front edges extend outward enough to keep your phone display from making contact with the ground. COMPATIBLE PHONE MODELS: Only fit for Apple Iphone 7/8 4.7 inches ( Not fit for Iphone 7 plus/8 plus 5.5 inches). Intimate Detachable Anti-lost Lanyard Design: With anti-lost lanyard, hold your phone more convenient and without worry of losing. Satisfaction Guarantee: 18 Months warranty and best customer service to protect your valuable investment. If you have any questions about this product by ZVE, contact us by completing and submitting the form below. If you are looking for a specif part number, please include it with your message.